Building a book and zine collection! Big news! We are starting an Extended Practice Book/Zine collection! It will not only be an online resource of books and zines, but a physical collection as well. The collection will include books and zines, related to being an artist and a mother. We will also include children's books by artists or about art. This collection will come with us to all future events, workshops, and exhibitions, including one big exhibit coming up at the end of this year. Stay tuned! In the meantime look out for updates on our website where we will have a page dedicated to sponsors of the collection, a list of all the books and where to find them. Feel free to contact us with suggestions. 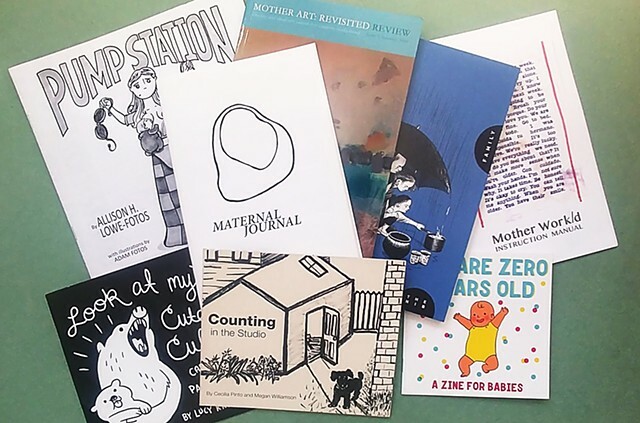 If you are a publisher or creator of a zine or book about being an artist and parent, let us know. Join Extended Practice and “Design a Wayfinding (treasure) Map” showing multiple ways you could creatively overcome obstacles to reach your goals (or find your treasure). Using the idea of Wayfinding and mapmaking as guides, Co-creators of Extended Practice will guide parents and their children in side-by-side map-making, using treasure maps as a fun and metaphorical guide. As children draw paths to their treasure boxes through challenging terrain, adults will identify and depict their own goals, as well as discover what obstacles get in the way of their goals. Parents will identify an unmet goal - their “treasure,” and will find creative ways to depict challenges or roadblocks preventing them from meeting that goal - are they “immovable like a mountain? Or dis-tractable, like a dragon?” All visitors can choose to work independently, as well as collaboratively, to come up with multiple creative solutions - “detours” - to move forward toward their goals. Emphasis will be placed on brainstorming/ planning multiple pathways around roadblocks - or even planning for multiple goals. 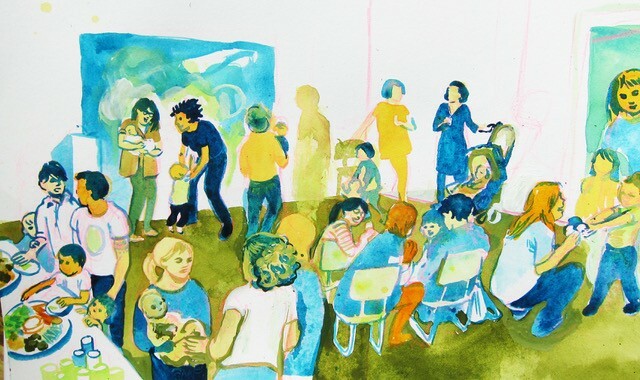 Firsts and Starts: Art-Making as a New Mother supported artists who are also new mothers by providing an intergenerational meeting and exhibition space within the gallery. Visually, the gallery was divided into two areas (the two inextricable realms of the new artist mother): space available for children (below) and space available for creative practice (above). The delineation between the two areas became blurred as the space filled with our children and artwork. Exuberant lines drawn by children leapt up - and oh so close! - to the creative work carefully installed by mothers above. At every turn the space below is pulling from - and at moments harmonizing with - the space above. The chalk, crayon and baby blankets underfoot activate and transform the space, while also representing the unyielding presence of parenthood in our creative practices. Everywhere you look, you get a sense of the surprises and challenges of art-making as a new mother. Self-identified new artist mothers were welcome to bring their children and their creative work to this space for a series of three meet-ups and several artist-supported installation sessions. At the meet-ups, we (new artist mothers) gathered together to discuss our individual successes and challenges. These conversations explored the day-to-day as well as overarching concerns: from how to manage childcare to how we define our studio practice. We discussed self-care and the ways in which our choices of material, process or scale shifted as we became parents. We recognized the importance of building community and looking to other artist mothers for inspiration or guidance. In our artist-led installation sessions we discussed individual art practices, projects and bodies of work while our children played. In this space, we formed new relationships and professional networks. Practices, ideas and projects that had been on hold during the tough first months and years of becoming a new parent were picked up and pursued with renewed excitement. We shared new work and new ways of working. We held each other's' children and artwork as we weighed placement options. Together, we created space in the art world where there wasn't space before - space for uncertainty and power, survival and healing, space for women and children, for artists who are mothers. SEE PHOTOS OF THE MEET UPS HERE! Firsts and Starts, features the work of new artist mothers in an intergenerational, interactive exhibition and meeting space. In this space, new artist mothers and their work are made visible at a time of rapid personal and creative transformation. Organized by Extended Practice - an artist-led project created to support and make visible the work and needs of artist mothers - Firsts and Starts will explore and demonstrate the kinds of shifts needed to support meaningful and productive engagement of new mothers in the art world. During the run of the exhibition, we will host three New Artist Mother meetups and a closing reception. These events inside the gallery elevate and make visible the process of grappling with the shifts in a new mother’s creative practice. Visually, the exhibition engages the two worlds of the new artist mother: the lower portion of the space is available to children and the upper portion is an additive display of the creative work of mothers. The installation will begin with the artwork of Emily Lindskoog, Tracy Marie Taylor, and Angela Lopez - who met at a new moms group hosted by Swedish Covenant Hospital and still look to each other for support in balancing parenthood and art making. 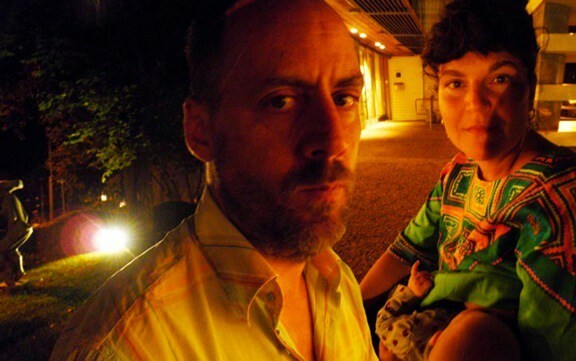 Joining them will be groups of self-identified new artist mothers – maybe even you! 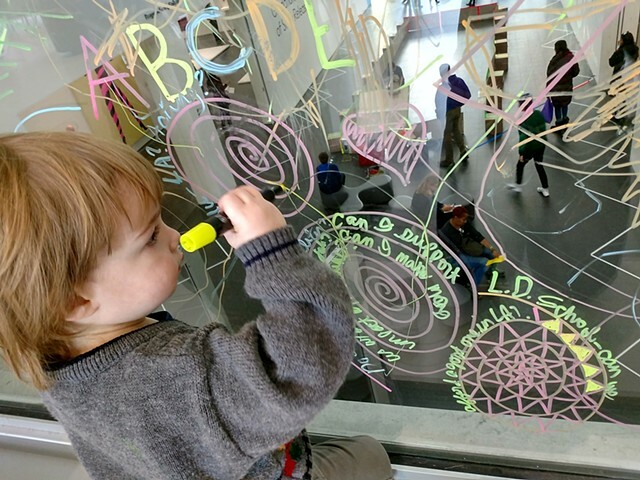 – who will engage in an artist-led and collaborative process for installing their own creative work in the exhibition, as their children play below. The gallery space will grow as a document of the evolving social networks, conversations and creative practices of the participating artist mothers. Outside of the New Artist Mom meet-ups the gallery will be open to the public - parents and non-parents alike - everyone is welcome! We're launching an Artist Mother Meet-Up initiative in your neighborhood! Build on the contacts you made at our events last fall, or make new ones. We're hoping to connect small groups in Chicago and beyond, and we need your input. Join us for an afternoon with artist Selina Trepp! 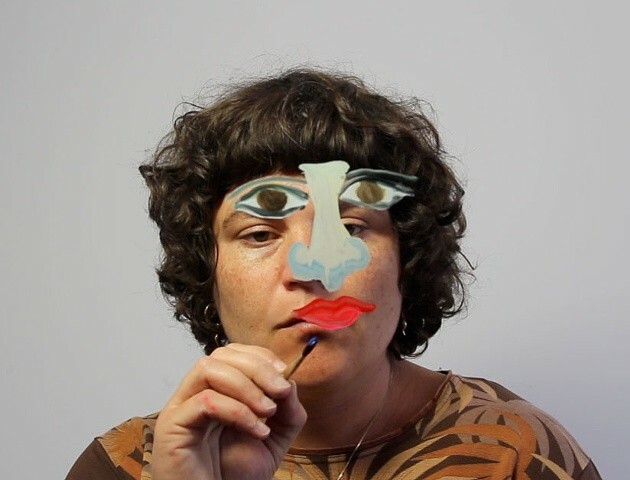 Trepp will give an artist talk and lead a discussion about how she empowers herself as a mother and artist. She will discuss her multi-disciplinary art practice, and will go into detail about how parenthood has affected her artistic production. Trepp will explain how she navigates logistics, politics, and money in her practice, and her interactions with institutions. Trepp’s talk will be followed by a Q&A/ discussion. Following the talk, participants are invited to a networking lunch - and brainstorming session - guided by founders of Extended Practice, Sara Holwerda and Angela Lopez. This session will allow individuals to focus on making connections with other artists parents and to envision how some of Trepp's strategies could apply to their own practices. Participants will explore what strategies they can build on to empower themselves as artists and mothers. SPECTRALINA is the collaborative audio-visual performance project of artists, musicians and parents Dan Bitney and Selina Trepp. Working with an improvisational structure, Spectralina combines singing, percussion, electronics and real-time video processing. Together, Bitney and Trepp create an engaging image and sound relationships in their performances, in which projected animation and improvised sounds come together as visual music. The first event is a childcare-supported gathering of mothers who make things. As children engage in supervised play and art making, mothers will connect with each other over a shared meal and guided conversation. At the second event we will celebrate the creative work of mothers of color. Everyone is welcome to join us for this one-night exhibition and sharing: families and extended support networks of friends, fans and supporters. Event series created and led by Wisdom Baty, in collaboration with Extended Practice and Experimental Station. 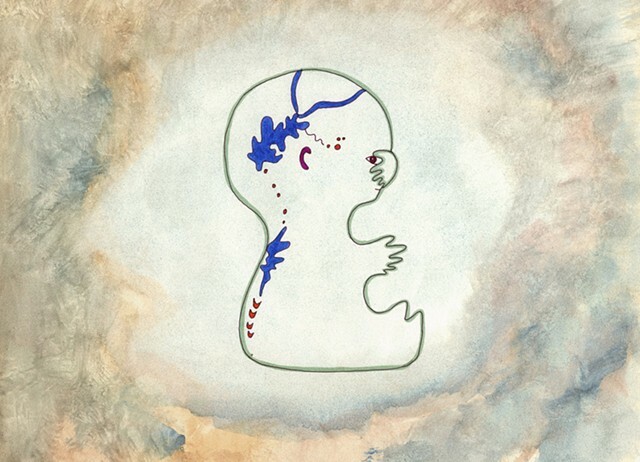 This international program of experimental animations illuminates the connection between the process of animation and the experience of parenting, and celebrates motherhood as especially rich creative territory. From the first flicker of life, a mother’s sense of time, space, reality and even her own body transforms. As a flexible medium, animation can construct realities and play with the elasticity of time and space. The works in this screening utilize intergenerational collaboration, evocative materiality, layered narratives, and the physical engagement of the creator with every frame. This screening is programmed for the Nightingale Cinema by Sara Holwerda and Angela Lopez as part of Extended Practice, an artist-led collaborative project created to support the work and needs of artists who are mothers. Nursing mothers are welcome. Light refreshments will be served. Funding for this screening is supported in part by the DCASE Individual Artist Project grant. FREE childcare will be at Present Place, located in the same building. So, you’ve decided to ignore the advice that a serious artist must choose between raising a family and pursuing a successful career in the arts. Now what? Join Christa Donner, artist and organizer of the creative platform Cultural ReProducers, for this idea-generating conversation and strategy-building workshop about “making it work” as a parent and artist. Participants will explore existing artist-led initiatives that address the challenges of artist-parenthood, and will reflect on their own experiences with balancing art-making and child-rearing. 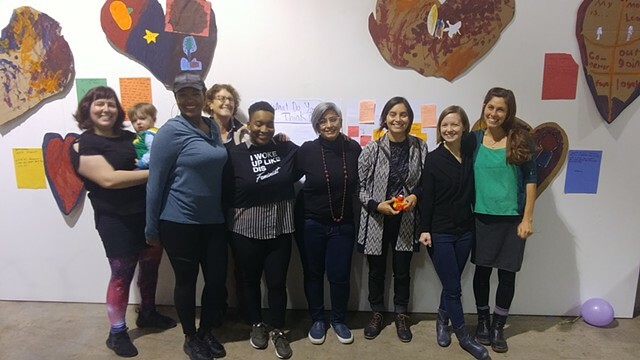 Through individual and collaborative activities, participants will identify key needs and desires of artists parents and will develop new models for a more sustainable artistic life in Chicago. A networking lunch (vegan and gluten free options) is paid for by your $10 registration fee. This project is made possible through the DCASE Individual Artist Project grant. Christa Donner is an artist, curator, and organizer who investigates the human/animal organism and its metaphors. In 2012, when her daughter was one year old, Donner initiated Cultural ReProducers, an evolving creative platform for and about cultural workers who are also working it out as parents. Cultural ReProducers continues to foster visibility and support through events, publications, skill-sharing, and an extensive online resource for artists and institutions. Donner's work has been exhibited nationally and internationally, including projects for the Max Planck Institute for the History of Science (Berlin, Germany), BankArt NYK (Yokohama, Japan); Chiaki Kamikawa Contemporary Art (Paphos, Cyprus); the Museum Bellerive (Zurich, Switzerland), the Centro Columbo Americano (Medellin, Colombia).